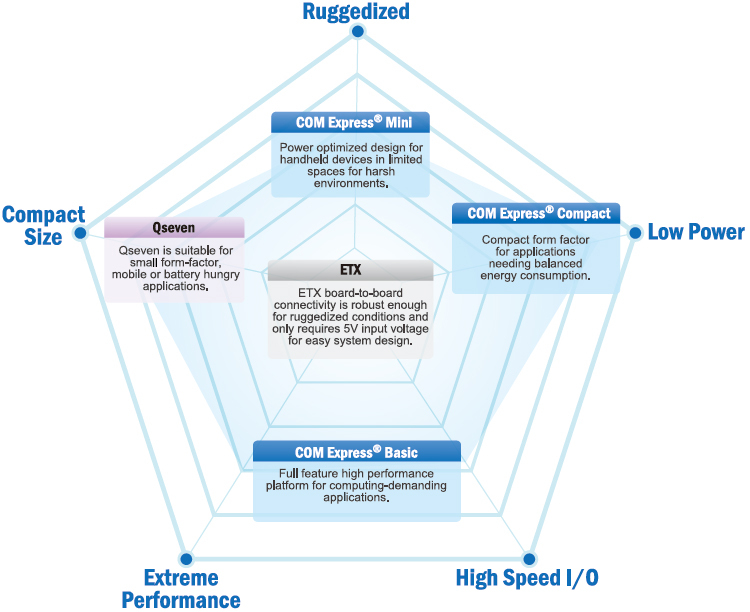 COM Express® is becoming the most popular COM specification due to the latest expansion interfaces and I/O, generating various pin-out types and three different form-factors. COM customers benefit from its flexibility and easy learning curve to serve a variety of applications. COM Express® provides not only high-speed interfaces like HDMI/DisplayPort, PCI Express, SATA and USB 3.0 for volume data transportation, but also LVDS, PCI, and IDE for legacy applications. COM Express® defines 3 dimensions: - 125 x 95mm,95 x 95mm, and 84 x 55mm - suitable for high performance, entry level, and portable applications. It also defines the PCB thickness to 2mm, onboard component height to under 8mm, and a total height from the bottom surface of the PCB module to the standard equipped heat-spreader top surface of 13mm. COM Express® allows a wide-range of input power voltages in a specific form factor which makes it more suitable for mobile, and battery environments.